Fidonet BBS Access – Forum – Politics – And More! GoDaddy.com Linux cPanel web hosting is an improvement but still has it’s problems. This review is intended to be a honest and truthful guide for others looking for dependable shared web hosting. There are so many paid reviews on the net it’s hard to know who to trust other than take it for a test drive as i have done. I have been a GoDaddy.com web-hosting critic in the past due to a poor experience with their service. But I’m always looking for a better web host so i figured why not try it for a month and check it out. So i set up an account with a rarely used domain to test it out. Initially the setup was fast and i had the 1st domain live in about 10 minutes. I then added three WordPress sites as add on domains that get a decent amount of traffic, including this one. Setting up add on domains is straight forward if your used to cPanel it’s a cinch. It was easy to zip up the files and ftp upload them to my GoDaddy account. Uncompressed the archive. Did a MySql dump of the database on the other account and after creating a new database on GoDaddy’s cPanel imported it. I have to note that in the phpMyAdmin page where you would import your database it says the maximum size is (Max: 1,024MiB) where my other host only allows up to (Max: 50MiB) so that’s an increase right there. Also a major concern with today’s Websites, especially WordPress websites is the number of processes that is allowed on shared hosting. On most shared hosting the max processes is 25. But with GoDaddy.com Linux hosting you get 100 consecutive processes. This is really useful if you are publishing lots of articles and social sharing to all the popular social media websites. Just tweeting a post will send a bevy of bots over to grab your tweeted post. It’s real easy to use up 25 processes. So far I’m really impressed with GoDaddy.com Shared Linux hosting with cPanel. Here is a screen shot of the GoDaddy cPanel that’s been cosmetically modified. As far as i can see all the usual cPanel services are included. Updated 03/05/2014: Getting an exhausted resources error when trying to log in to WordPress. Never seen this one before on my other host. Will have to open a support ticket with GoDaddy and see what’s causing this. And this don’t look good either. 40.3% server busy errors is the sign of an overloaded server. The time period is roughly 24 hours. Updated 03/06/2014: It’s been well over 24 hours since i opened up a support ticket with GoDaddy.com and no response yet. I added the below message to the support ticket. Other than this overloaded function error that i have seen quite a bit of today, and the percentage of server busy notifications in the stats, I’m still impressed with the sites page load speed and performance. Hopefully they will get those concerns resolved soon. Update 03/07/2014: This morning after still not receiving an email from GoDaddy’s support dept, I decided to give them a call. The call was answered quickly and the support representative was friendly. I gave him the ticket number and he put me on hold for about 10 minutes. The call was dropped twice but the rep called me right back. GoDaddy’s rep said my website has too many plugins and its too busy for shared hosting because it is consuming too many resources. He suggested i get a dedicated server to handle the load. I disagree with that. Also GoDaddy’s system admin must have changed my sites password, which is easy to do in the MySQL database. After getting off the phone with support and trying to login my password was rejected. I think they went in and looked at what plugins i was using etc while i was on hold. Not a big deal to reset it though. GoDaddy only gives 512mb of base memory which is in no way enough to run a WordPress website that is social sharing articles. My screen shot above of GoDaddy’s cPanel is showing nearly half of the base memory used. My site gets at most 200 Human visitors daily not counting the hoard of bots that come rushing over every time an article is shared. I’m thinking nosy bots are another a problem that needs looked into. Amazonaws.com is one of the worst offenders. They hide countless numbers of bots identities, and the greatest majority are not identified by user agent string. And amazonaws has so many IP blocks is nearly impossible to block them all, and if you do you might block someone that has good intentions. Bottom line here is. GoDaddy’s shared cPanel web hosting will probably be fine if your running a basic html or php website. Or even a WordPress website if your not social sharing your articles and the site gets only a few visitors daily. So consider that when considering them for web hosting. I gave up and put my site back on my other host (HostGator) It works fine on it. I did a name server lookup on my GoDaddy server IP and found it only had 30 websites hosted on it, vrs HostGator’s 117. Also of possible interest, HostGator’s cPanel does not show a base memory and io usage graphs. Their shared hosting obviously has enough of both to not be a problem even with several add on domains per hosting account. This is my http status codes display from HostGator. No 503 server busy errors at all. My GoDaddy cPanel http error status codes display showing 40.3 percent 503 server busy errors. For every “Server Busy” your potential buyers see your loosing money. Most people just click back and shop elsewhere. Also i should also mention that this website is being run through CloudFlare that acts as a resource management and caching enhancement. CloudFlare actually reduces the resource usage of your server. Without it i bet those 503 errors would be much higher. Here is a review i published about CloudFlare. Also when using CloudFlare and changing web hosts, you don’t have to change your name servers. Just go to your domains dns setup and change the server IP. It’s updated instantly. No long propagation time. Cancel my account, you have incompetent phone customer service. Simply asked the guy how to configure a wp-config.php file properly because my domain was giving me 500 errors. It was clearly caused by using a wrong db name and db username string. I was simply looking for what the format of the string was (example) host gator uses “adminname_dbname”, “adminname_dbusername” and “localhost”. Apparently at godaddy it’s different. I visit the help section on getting the string and it tells me there is an “actions” link next to the database names in the MYSQL manager, (NO ACTIONS) Link, just a trash can for deleting the databases. Your help section is wrong. Your incompetent phone tech support didn’t even know what a wp config file was. (WordPress 101 Basics), your phone support then came back and said he couldn’t help me and told me to visit some website. Complete waste of my time. Still the old crap merchant as always. Just a new appearence. It’s pretty bad when GoDaddy support does not know what a wp-config file is. The username has to be the username of the database, not the username of the cpanel.The 500 errors were coming from their server config. They need to see a full cpanel WP install else WP doesn’t work. I typically copy the files over and import the data base and I’m up in running. Never had issues. I wound up cursing and hanging up at the guy because of his level of incompetence. I had even asked for a supervisor half way into the phone call and he wouldn’t get me one. I guess the first straw that broke the camels back was the first call to GoDaddy when I had to find out they were issuing more then one set of nameservers for addon domains on one account. That guy knew more of what he was talking about then this idiot I spoke with today. I don’t have time to waste with idiots that get hired as tech supports with no real computer or IT background or knowledge of their own product. I used a domain already hosted by GoDaddy. Just changed it’s name servers to their standard parked / hosting defaults. Zipped up and transfered my files. Imported my database and set wp-config and the site came right up. The different db and user through me for a few minutes. Other than the faults I listed in my review the hosting is not too bad if you have a basic website without much traffic. Possibly GoDaddy could up the available resources a little. Hello I have a problem with my phpmyadmin. Every time I export a database it only takes half. Is that a godaddy problem? Export or Import? If importing it must not exceed the allowed size. Never experienced a failure exporting a database before. Exporting. Dude I’m trying to export a database that’s 1.3MB in size. For some reason I only get 637kb. Is it a browser problem or execution problem? If so, how do I fix that? Never experienced that before. Possibly run repair on your database before trying again. Or try at another time when the server is less busy. Otherwise I don’t know. Maybe try calling support. It depends on how you are exporting, 1.3MB is probably the uncompressed size, if you are using any compression then that number sounds correct. One way to investigate if it’s an execution or exhausted memory issue is to check your Apache error logs and you will probably find it right away if it is. If this is a VPS checking your stats from the hostnode will show you, or if it’s OpenVZ/Virtuozzo check /proc/user_beancounters for failures. I own a competing hosting and IT company but I’m going to be blatantly honest. Doc is right that 512MB of RAM is not enough to run cPanel, let alone a WordPress site. I’ve seen a busy WordPress site without any control panel use several GB of RAM, it is just intensive. 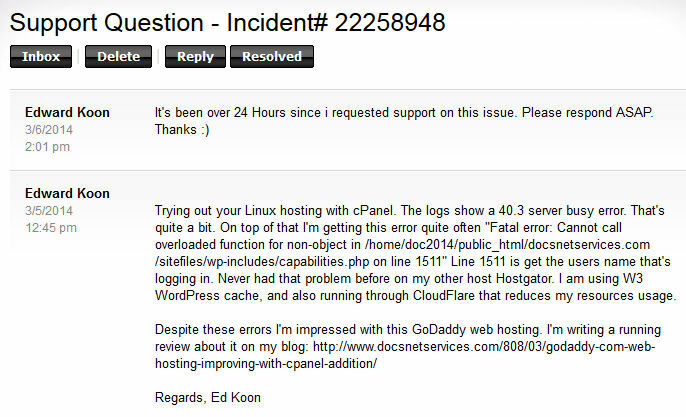 So the errors seen above are not really a GoDaddy problem per say but more of a symptom of lack of resources. Now for the other possible network issues, it is hard to say if it is really a network issue or again, it could be a symptom of failed memory allocation which may appear to be another problem. The best way to identify what the case is would be to do a constant ping and traceroute to see if there is an issue on your end or the GoDaddy end. Once again, being fair, if there is an issue on the GoDaddy end, it is likely due to an overloaded server which is common with many VPS providers. When going for budget or value services, there is always a trade off no matter how good the offer looks. Hi Areeb, thanks for your comments. Moved on to a VPS box via Vultr.com rock solid and great prices. GoDaddy has got to pricey for my taste. GoDaddy quit issuing coupons for domain renewals, and base dot com registration is to high. Name.com has good prices with free privacy, even on renewals. Use discount code privacyplease. I have a GD cPanel shared hosting account which include email accounts. I set up whatever email accounts I needed in cPanel for convenience. All was good until a couple weeks ago when all cPanel outgoing email started experiencing long delays (10 minutes – 12 hours). That’s right hours. I thought it might be a temporary problem, but it didn’t improve. I called/chatted with tech support, tweaked a couple of settings but still no improvement. Eventually I was told, it was the norm on their shared hosting, accept it, and by the way we’d be happy to set you up with a separate email account that will work for an extra monthly charge. I’m not sure if it’s an intentional slowdown to up-sell people to separate email accounts, or a severely under-resourced SMTP server. I have the feeling it’s an attempt by management to squeeze more revenue out of their customer base. Either way, it’s not right. Don’t include email with cPanel if it’s not going to work. I only have a few email accounts to migrate but it’s still a hassle. I feel sorry for anybody that might have 100’s. I also feel sorry for the GD tech people that have no other option than to explain over and over that cPanel email doesn’t work and try to make the up-sell. Sounds like an up-sell to me. 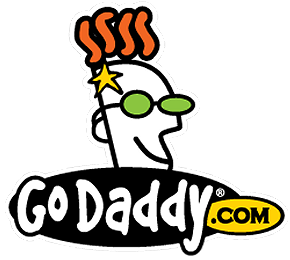 I don’t use GoDaddy any longer, and that includes domain registration. These days shared hosting blows, in my opinion. Been there – done that. Last decent shared hosting was from Hostgator, but that went to hell when EIG bought Hostgator. If you are tech savvy i recommend Vultr.com to set up a server. They have plans as low as $10 month. cPanel is an additional $15 for the license. Vultr is where this blog is hosted and were pleased with the service. Note: I have a range of GoDaddy IP’s blocked due to spam and hacking attempts. I’m sure many other admins do the same. That will definitely block email originating out of GoDaddy’s servers. I discover that Godaddy supports Linux better than Windows or OSX. I would like to say thanks for helping us to gather information about Godaddy support.